Occupy London claims to have repossessed an empty complex of buildings north of Finsbury Square. The new site is the third in London for the economic justice campaigners who also have camps in Finsbury Square and beside St Paul's. The occupied complex comprises property on Sun Street, Crown Place, Earl Street and Wilson Street, all owned by investment bank UBS. 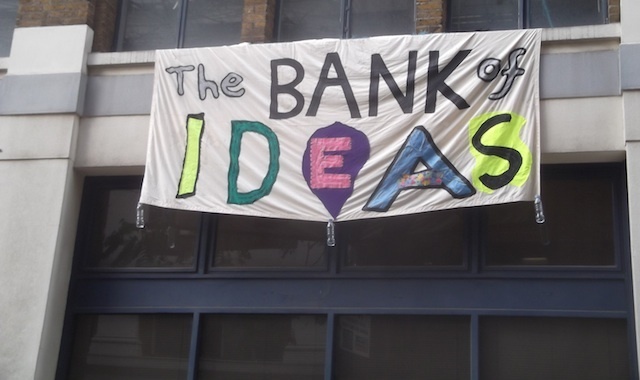 Campaigners will open a so-called Bank of Ideas tomorrow, with an events programme including 'talks from Palestinian activists, comedy from Josie Long and a session led by trader Alessio Rastani, who sent shockwaves through the media following a provocative interview on the Eurozone crisis'. A walk around the perimeter this morning revealed no signs of the occupation, other than a banner for the Bank of Ideas, weighted down with water bottles. By spreading their presence from the City, into Islington and now Hackney boroughs, the campaigners are aping the encroachment of the Square Mile's financial institutions into the City fringes. The occupied building sits alongside 30 Crown Place, the 22-storey office complex several block north of the traditional City limits, and one of many planned developments in this area.